Amazon use customer reviews to help shoppers identify the best products. Inaccurate feedback would undermine the system, so the feedback itself is also ranked by users and curated by the system. Unhelpful feedback drops down the list and becomes less visible. eBay encourages trust amongst strangers. Those giving malicious or inaccurate feedback can be reported. They risk losing the value represented by the feedback they have built up over time on their profile. Medical education makes extensive use of feedback. Teachers are (usually) well trained in providing useful feedback. Feedback remains a key component of training, in annual GP appraisals and revalidation. My thermostat uses feedback to keep my home at my favourite temperature. 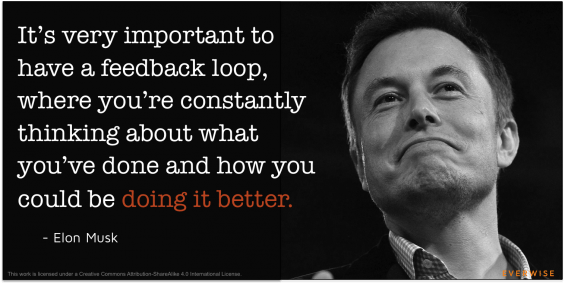 Feedback is most effective when it is built into a system to continually drive improvements. NHS Choices is an attractive idea. But it is really a system for assisting patient choice rather than helping practices to improve. The feedback it provides is usually anonymous so incidents are hard to investigate. As incidents cannot be investigated it makes learning any lessons difficult. It can be unfocused, often relating to an impression of services built up over years. Recent improvements (or declines) can be hard to spot. It is poorly moderated and often frustratingly inaccurate. Finally, patients can be unhappy for the wrong reasons. Sometimes it is simply not good medicine for doctors to give patients everything they want. Feedback can be used by GP surgeries to drive improvement. But practices need to set up their own systems to overcome these problems. At our practice we have been using our own feedback system to learn from our mistakes (and successes) for the last 2 years. It isn’t perfect or the only way to do it, but it has been very helpful, and we have improved. 1. Set up an automatic daily search for all patients who received an appointment, visit or telephone call the previous day. 2. Automatically send these patients a text message inviting them to provide feedback about their last contact with the practice by clicking on a hyperlink embedded in the message. 4. The survey contains only the friends and family questions and a small number of focussed follow up questions. 5. Every month we share the free text comments and statistics about our service at our whole staff meeting. We celebrate our success and discuss how to improve where problems are identified. We generate action points and put them into action. 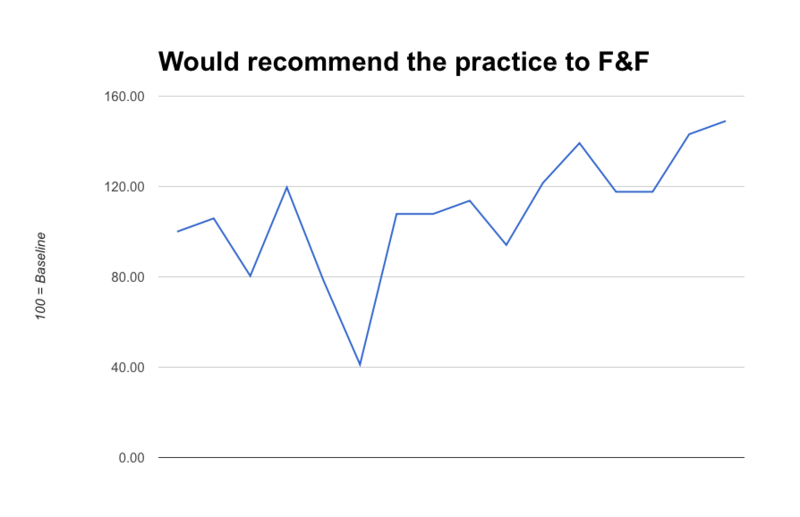 It hasn’t all been plain sailing… An ill fated GP telephone triage pilot scheme really hit our feedback scores for a time. We recognised this and changed. 6. We repeat the process, sending out feedback requests every day and meet and discuss the statistical and qualitative feedback with the whole team every month. 7. We keep the questions and methodology the same so that the results are comparable over time. Changes are due to changes in service quality rather than how we collect the data. 8. Once setup, the system requires very little input to keep it up, running and providing data. Patients enter their own data and the information is processed and presented automatically. Our staff have responded really well to receiving monthly feedback about patient satisfaction. We now receive many more positive than negative comments. This positive feedback is great for keeping the team motivated. We now also use this text based mechanism to recruit patients to our electronic participation group by providing the option to sign up by providing an email address. We are beginning to experiment with creating feedback loops for other areas of practice performance, such as task turnaround times and the time patients spend waiting in surgery for their appointments to begin. I’ll write about how this goes in the future. Do you get people opting out of SMS because they get fed up with receiving the messages? If so does that then impact on things like appointment reminders? We also had this concern before going ahead with the project. It has been up and running for over 2 years now and we haven’t had a single negative comment about receiving the texts or any requests to opt out. We get about 30-40 replies a month on a list of about 7,000. If you give it a go, I’d be interested to know how you get on. That is very encouraging. I’m not in clinical practice now, but will bring it to the attention of my erstwhile colleagues! Some interesting ideas! Another great blog.